Normally DAC mode %10111 sets a 2.0 volt output level. I'm assuming this is overridden by the BIT_DAC set level. Nope. The smart pin doesn't control the internal pull down resistor, only the 8-bit DAC output value. If you set 2.0 volt mode, that's where it works. Ah, of course, I confused level with range for a moment there. 25-11-2018: Reverse the update. Doh! 26-12-2018: Typo, R -> % in BIT_DAC mode line. And stated for engineering sample. seems to vary considerably with mode. ## is so incredibly handy! Yeah, not much written so far on the mix'n'matching of sections in the WRPIN mode config. It didn't have as much flexibility in the FPGA. Can we hope that you have been making notes as you figure things out and contribute them to the documentation? 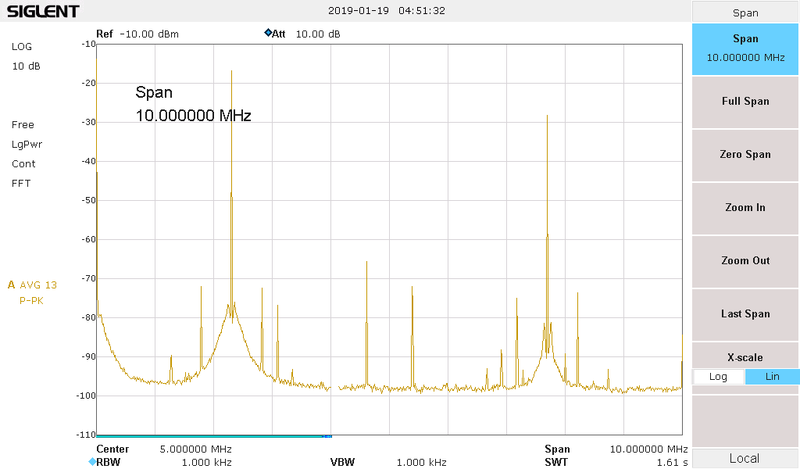 got to work on streaming modes 3-fold pipelined cordic -> dithered DAC mode was last nights example, looks pretty clean on spectrum analyzer. smartpin in DAC dither mode. That's 10MSPS rate.
' which reads its frequency long from hub every sample for full agility.
' timing of CORDIC and FIFO/Smartpin windows? frq[i] += 10000    ' spin increments the frequency slowly. Got a question about Fastspin though: I can see freq array defined in hubRAM and the cog code fetching those values. But you are launching a separate cog with its own cog variables and RDFAST appears to get it's freq_addr from the Spin code at runtime. Is that a feature of filling it out, effectively self-modifying, so that it is copied into the cog upon COGINIT? I've never written any Spin code, is that something that could be done in the original Prop1 Spin? - RDFAST primes itself unless D is set. - The "setup" loop is already 10 clocks long without any NOP. So the following is a little tidier even if it achieves no more. And replacing the JMP with a REP will recover 4 clocks if there was a need for that. Is this due to branch instructions taking more than 2 cycles? Ah, that's a clever way round it. yep, opposite timing order to the Prop1. Prop2 is four clocks if branch taken and two clocks if branch not taken. I think compensating for this change is the main reason Chip added the REP instruction. But be aware, REP does have restrictions. And not all were designed in. In this case though, it'll work fine. have been a miracle! Hopefully Chip's scheduled in a few months of sleep after the next silicon revision goes out! Yes, REP is tool without a safety guard, but worries me less than SKIP/SKIPF ! 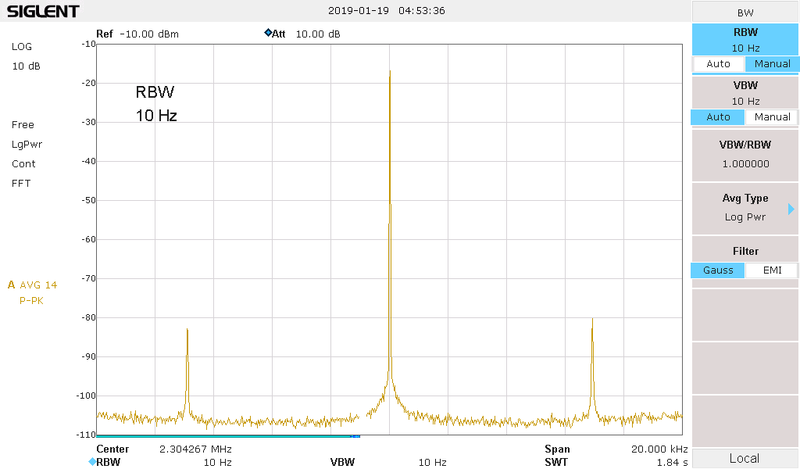 obvious in the first 10M span spectrum. Then I zoom in closer to the tone. 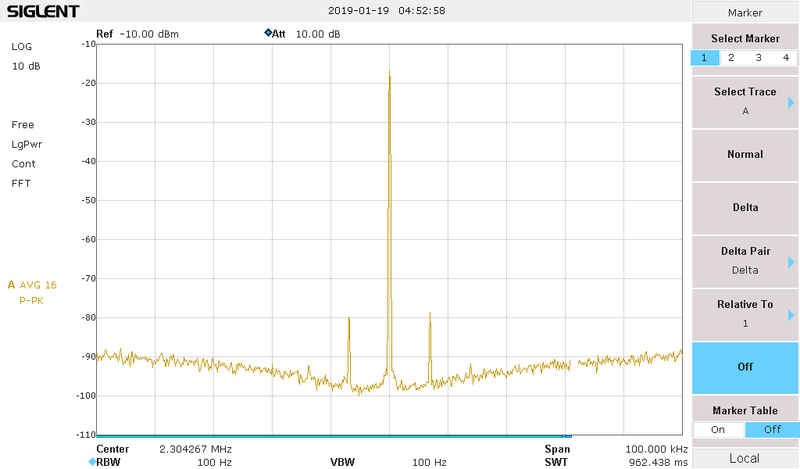 Siglent SSA3021X analyzer - some of the broad sidebands may be the limiting phase noise of the SA itself, note. 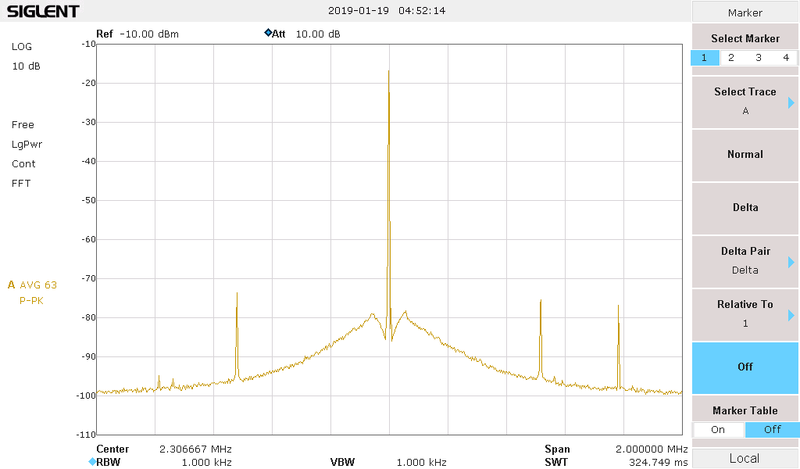 The 2nd harmonic of 4.608MHz is about 50dB down. +/- 7kHz approx, see the PLL wobble thread... I haven't tested other pins to see if it varies yet.